Canon U.S.A., Inc. is showing its Pro AV Compact Installation LCOS (Liquid Crystal on Silicon) projector category at InfoComm 2015. Among these projectors is the Canon REALiS WUX500 Pro AV Compact Installation LCOS Projector. The Canon REALiS WUX500 is a projector that combines WUXGA resolution (1920 x 1200), 5000 lumens of brightness and up to a 2000:1 contrast ratio, built-in HDBaseT, an advanced lens and optical system, and Canon’s LCOS technology with AISYS-enhancement. Weighing 13 lbs., the Canon REALiS WUX500 was designed for a range of markets including higher education, corporate, simulation and training, museums and galleries, houses of worship, and digital signage. The REALiS WUX6000 Pro AV Installation LCOS Projector is designed to deliver 6000-lumen high-resolution WUXGA (1920 x 1200) widescreen video and still images in a variety of environments. 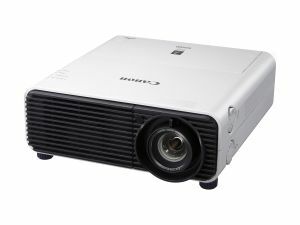 Equipped with Canon’s LCOS Technology with AISYS-enhancement, and an advanced image processing engine, this projector displays images with intricate detail, accurate color, crisp contrast, sharp blacks, and blur-free motion. Features include multiple image-mode settings and picture/color adjustments, a wide range of optional Genuine Canon projection lenses to match a variety of installation environments and screen sizes ranging from 40 inches to 600 inches, and a motorized lens-shift function for easy positioning. Advanced Professional Calibration settings, including Edge Blending and Four-point Keystone Correction, support custom installations. Extensive connectivity is provided via HDMI, DVI and other leading network interfaces.